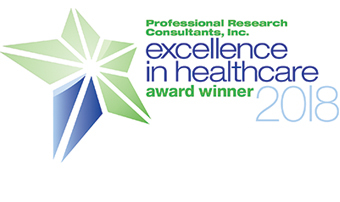 Health care leaders from across the United States gathered together for the 19th annual PRC Excellence in Healthcare Awards Conference, held recently in Charleston, SC. Our three MHS hospitals garnered a total of 21 awards for achievement of excellence in patient satisfaction at the facility and unit levels, including 16 5-Star awards, two 4-Star awards, two Top Performer awards and an Award of Distinction for Methodist Women's Hospital. Professional Research Consultants (PRC) is a nationally-known health care marketing research company headquartered in Omaha. PRC patient perception research is conducted to obtain the opinions of the patients at MHS hospitals via a confidential survey that assesses their perceptions of patient care. These and other research findings are used to continuously improve and enhance patient satisfaction throughout Methodist Health System. The PRC Patient Experience Award of Distinction for Excellent Performance recognizes health care facilities that score at or above the 100th percentile for the Overall Quality of Care percent "Excellent" score in PRC's national client database for the prior calendar year. PRC Top Performer Patient Experience Awards are given annually to outpatient service lines, inpatient units and outpatient clinics that score at or above the 100th percentile for the Overall Quality of Care percent "Excellent" score in PRC's national client database for the prior calendar year. The 5-Star Award is given annually to health care facilities, providers, outpatient service lines and inpatient units that score in the top 10 percent (at or or above the 90th percentile) in PRC's national client database for the prior calendar year. These awards are based on the percentage of patients who answer "Excellent" for the Overall Quality of Care question. The PRC 4-Star Patient Experience Award is given annually to inpatient facilities, outpatient facilities and emergency departments scoring in the top 25 percent nationally — and in the top 75th through 89th percentiles — in PRC's national client database for the prior calendar year. These awards are based on the percentage of patients who answer "Excellent" for the Overall Quality of Care question.